The weather this spring is awesome, isn’t it? But how does Spokane’s weather stand up, by the numbers? Annual Days of Sunshine in Washington – Current Results. 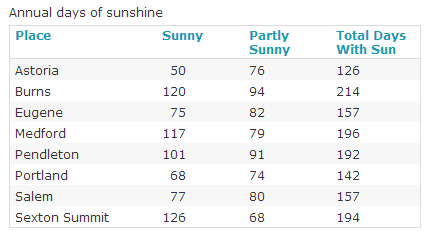 Spokane’s days of sunshine per year (on average) is surprisingly similar to Seattle. Not what many of us might have expected. How are those weather terms defined? If the sun shines for 70% of the day time or more, its a “Sunny” day. If the sun shines for between 21% and 69% of the day, its “Partly Sunny or Partly Cloudy” day. What’s the difference? The sun doesn’t shine at night so we call it “Partly cloudy”. If the sun shines for less than 20% of the day, its “Cloudy”. As I predicted in August, Spokane MSA unemployment has gone up to 9.0%. As of January 2012, Spokane’s unemployment reached 9.8% in January (update: 10.1% in February). There have been a very large number of business closings, particularly in the retail sector, from January through March. February employment data will be available on March 29th. Non-farm employment fell to 201,200 in January 2012 which is 200 fewer jobs than in January 2011. 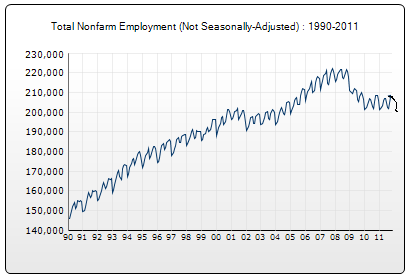 In January 2012, the total # of non-farm employed reached an all time low since 2005. 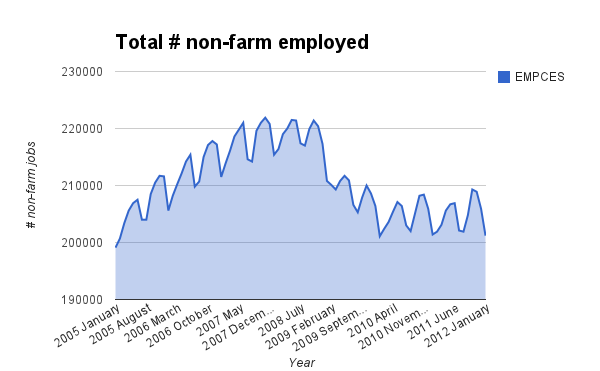 Stated another way, January 2012 is the lowest non-farm employment we have seen in this recession. 1 out of every 10 jobs disappeared from the peak to today; at the peak, the unemployment rate was 5% to 6%. But things are better now in Spokane because the unemployment rate went from 10.9% to 9.8%. Doublethink! Data comes from the Washington Employment Security Department web site. In terms of people holding jobs, Spokane has seen no recovery from the Great Recession and has just reached a new all time employment low for this recession. People may have given up looking for work, moved outside the County to find jobs, become self-employed or be in jail. That could explain a declining unemployment percentage while the number of workers continues to fall. 35% of home sales are distressed properties (such as foreclosures) but unit sales increased by 41%, partially due to a large percentage increase in a small number. Prices are expected to fall the remainder of 2012. 27% of adults have a 4-year college degree or higher but most of the college educated live in three neighborhoods on South Hill or around Whitworth University. As we move away from those neighborhoods, the college educated rate drops to around 18-21%, and 10% or lower for the bulk of Spokane, north of the Spokane River (but excluding Whitworth University neighborhood). Spokane’s college educated population is strongly skewed to South Hill and the Whitworth University area. 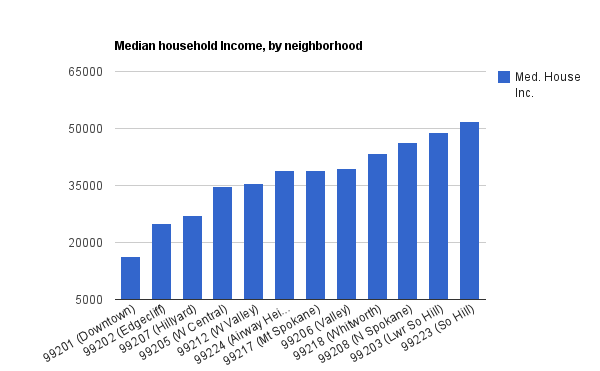 Outside of those two neighborhoods, the population is comparatively poorly educated. I compared the above percentages to areas in King County, the San Francisco Bay area, and Austin, Texas, known for strong economies. In all but one of those zip codes I checked, the percent of adults having a 4-year college degree or higher ranged from 43% to 75%. 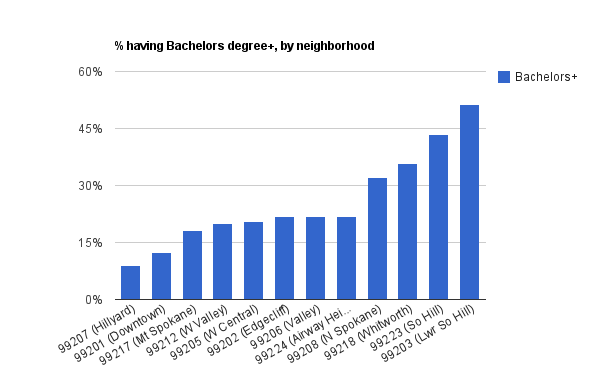 This was not a large sample of zip codes, was probably not random and it could be wrong but … it hints that the educational attainment of Spokane adults is not where it ought to be for local economic success. Today there is little demand by Spokane employers for college educated workers. As seen in this chart, few job vacancies require a 4-year degree or higher. Demographic data, organized by Zip Code, are available online from numerous web sites. The City-Data web site and Zipskinny.com were used for the above charts. Spokane is filled with vacant buildings – all of which are apparently invisible as no one talks about this publicly. There are 18 invisible empty store fronts inside the Valley Mall (first weekend in March); there were 22 (+ or -) invisible empty store fronts inside the Northtown Mall. In the downtown area, there are entire blocks of invisible, mostly empty buildings. Drive down Sprague Ave from Sullivan to Mullan/Argonne Roads in Spokane Valley – I counted so many For Sale/For Lease signs that it worked out to an average of a sign every 3 seconds while driving along that 2 1/2 mile stretch of road. Turn right on Mullan Rd and see the same # down the next mile to I-90. All of these empty buildings are invisible. They do not exist. There is no public discussion. There is no media coverage. In fact, we do not need to envision a better Spokane because Spokane is already perfect! Oddly, in 2006, the news reported that a 4% retail vacancy rate is a “healthy market” but in 2012 a 12% vacancy rate on South Hill is a “booming” retail market. So what would a 24% retail vacancy rate in Spokane Valley be? How about “One of the brightest spots in the mix is Spokane’s bubbling retail sector“? Orwellian Doublethink is alive and well in Spokane. 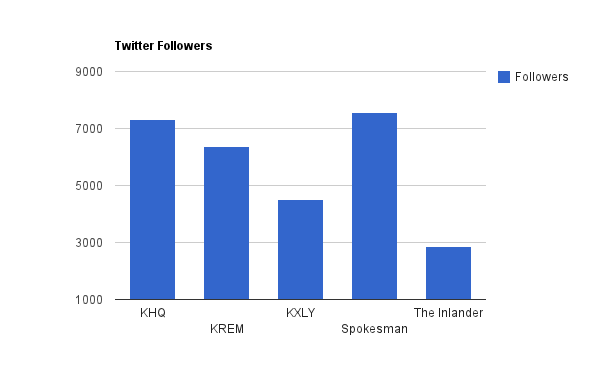 Confirmation of what this web site has documented through actual data – Spokane’s economy continues to slide while the rest of the state is growing. (This update added April 28, 2012). 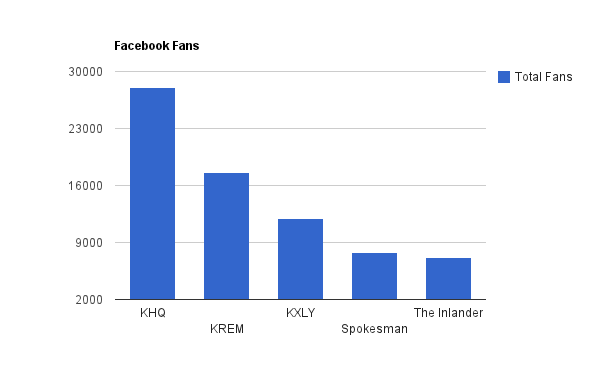 ** KHQ TV and the Spokesman-Review are both owned by the Cowles family business and perhaps should be treated as a single number of about 43,500 on Facebook. 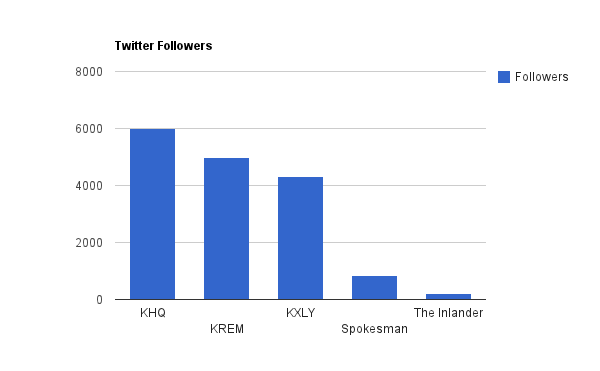 Each organization also has staff members with Twitter accounts. The above lists only the number of followers for their “main” Twitter user ID. The odds of winning the Washington Lottery are about 1 in 7 million. Much better odds are to become a Spokane Police officer, act dimwitted on or off the job, get up to five years paid administrative leave (vacation? ), then get fired and sue the city and walk off with a million $ payout. The odds of winning the SPD lottery are about 1 in 100, far better than buying a Washington Lottery ticket. Updates to this web site are made on an infrequent basis. May be there will be more updates, or may be there will not be more updates. Actually there is going to be another update real soon that was written last year, never published but recently brought up to date. Stay tuned. From airplane parts to medical devices, cookware, pharmaceuticals and mining equipment, factories across the region are collecting contracts that square with the national trend of burgeoning productivity. Even though manufacturers rely more and more upon automation and greater productivity from every worker, hiring is on the rise. In Spokane, for example, there were 15,325 people employed by manufacturing firms in December, the most since late 2009.
via “Encouraging Signs Emerging from Great Recession”, Spokesman-Review. It’s a rainy morning and unfortunately I have not yet forgotten how to make a chart. So let’s chart some actual data! Corridor funding may hit dead end – Spokesman.com – Sept. 4, 2011. This is the half billion $ freeway from nowhere to nowhere in north Spokane. Spokane’s economy is fading because leadership blew money on projects that did not deliver a positive return on investment to the whole community but instead benefited powerful and well connected rent-seekers siphoning public money for projects that benefit themselves. As shown in the post, below, pay for high skilled private sector workers in Spokane County (law, business, science and technology) is surprisingly low. 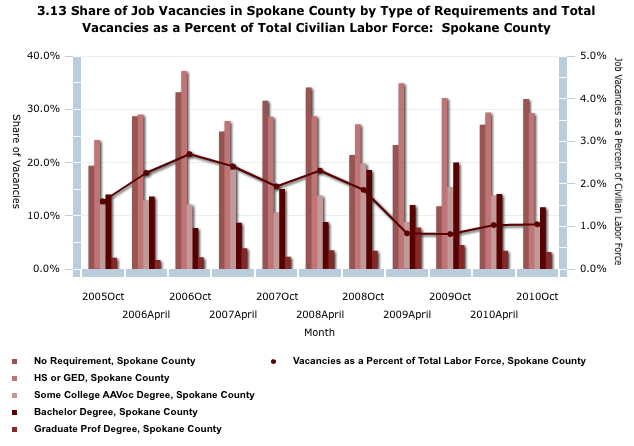 The demand for high skilled workers in Spokane County is low. There are about twice as many people with a 4-year degree as there are job openings needing a 4-year degree qualified worker*. There are about three times as many people with graduate degrees as there are job openings needing a graduate degree qualified worker*. The low demand for highly educated workers in Spokane is a likely reason wages for the highly skilled are so low. About 2/3ds of the job openings require a high school diploma or less. 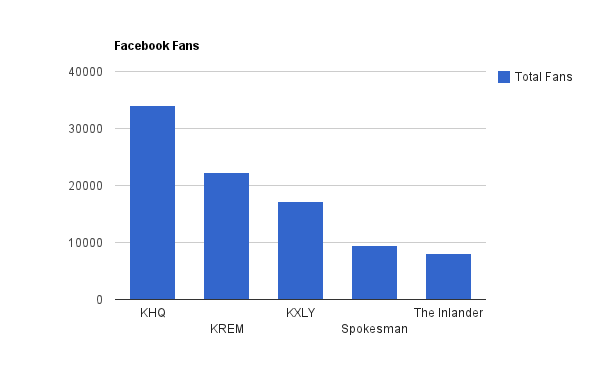 Chart comes from the Community Indicators of Spokane. Besides the “Recommendations” posted in the right most column of this web site, what else might be done to create an ecosystem demanding higher skilled workers in Spokane? Update: Local PR news article refers to Spokane as a “blue collar city”, which helps to explain the low wage issue. This article is part of a lobbying effort to continue receiving a 30% taxpayer funded subsidy to movie makers in Washington. For amusement, see how the local TV news hacked this story down to a few meaningless sentences. Funny. * About 25% of adults here have a 4-year degree but the demand is about 12% to 15% of job openings. About 10% have a graduate degree but the demand is about 2% to 4% of job openings. Spikes in 4-year degree job openings in 2007-2009 have to do with the recession when lower skilled workers were typically the first to get fired and higher skilled workers were the first to be hired. A sample of job categories was selected from the Workforce Explorer web site for Industry Trends. A few were dropped out because the job category did not exist in both counties. Most Spokane County workers are paid less and professional high skilled private sector workers are paid a lot less. While we have come to expect lower pay in Spokane, some of the differences are shocking. Table of average wages in $s in Spokane versus King County. The difference is shown in the right most column. Bright green is higher. Dark green is “close”. Bright red is -24% or worse difference. Wage data from the State’s Workforce Explorer Industry Trends section. Education sector pays about the same. Government and health care pay some what less. Private sector highly educated workers are paid remarkably less. Those considering moving to Spokane need to consider the income ramifications of their career sector. At present pay levels, there will not be a science or technology cluster in Spokane. With extraordinarily low pay, Spokane will have difficulty attracting high quality scientists and engineers needed to create a regionally or nationally competitive science and technology cluster. At present pay levels, the same issue impacts creation of national classes businesses. “Editors” average is about the same in both counties. This may account for why there is little news coverage of the chronic low wage problem in Spokane – low wages do not affect them! But reporters’ pay – ick! Would be interesting to compare pay scales to Benton-Franklin counties, and to Clark County (Vancouver, Wa) area.